We’ve written about Coalatree a few different times (you can check those out here), and I like the approach that they’re taking for things. They seem to have hit a balance between outdoors and travel, with regards to where their products would best fit (spoiler: it’s for both). 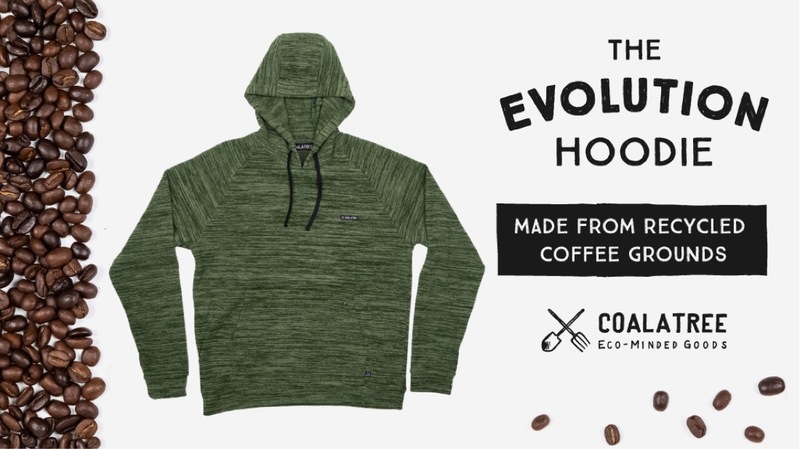 Their latest entry is now live on Kickstarter, the Coalatree Evolution Hoodie. As with the other items we’ve had a look at from the brand, the Coalatree Evolution Hoodie takes things in a bit of an eco-friendly direction as well. This time around, it’s coffee entering the mix. Specifically, they’re taking used coffee grounds, which are then mixed in and melted with recycled plastic bottles to make the fibers for the hoodie. I guess that would make them semi-synthetic? And here I thought I was being clever by putting my used grounds into my gardens and compost bin. Also like their prior products, the Coalatree Evolution Hoodie can pack itself into it’s own pocket. This is just a handy way to keep things organized, and then easy to throw a bundled up item – in this case, a hoodie – into a backpack to have it when you need it. The pocket also is one of the key features of the hoodie. This is a large, zippered, pouch up front that, rather than making use of the hand warmer pocket, actually goes inside the body of the hoodie, against you. Inside there, you’ve got a couple of organizer pockets – and a key loop – so you can keep things organized and secure on your person.